Reusing some of my old gear I made this new station. I elevated the workstation and added one of those high intensity COB led lights via a coat hanger. 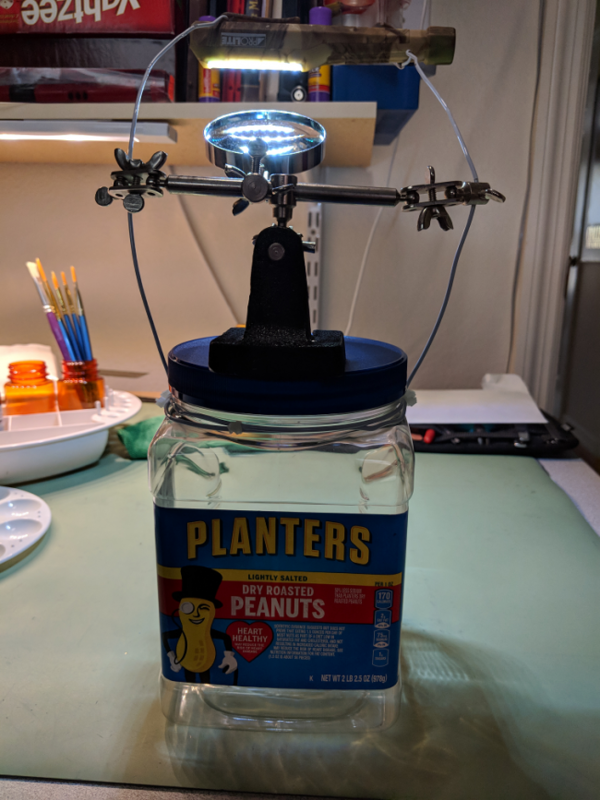 I will add weight to the peanut jar to stabilize the whole thing. I also picked up the idea of using pill bottles as a paint base. In the past I used a wooden dowel which worked fine, however, I had to have a stiff foam block to stick the dowel in between sessions. With the bottle I can just set it down. So what does your station look like and what little tricks have you discovered? Nice! My usual painting station has been made unavailable, but I will snap a photo when I sit down to paint this week and will post then! I use that table top for everything so I had to make something very portable. It will fit on the shelf where I keep the pallet and the paint/brush holder you can see in the background. Very cool bit of homebrewed construction! Very home-brewed. ) The hardest part was finding a wire coat hanger. Those beast are near extinct around here. Some biological shipping containers waiting to be painted. The astronaut is a contender to represent a character doing EVA. Wow, sometimes nature provides the best prop. Maybe a little sealer will preserve it. Dude that's awesome and perfect! I've had to become much more portable over the last year or so. 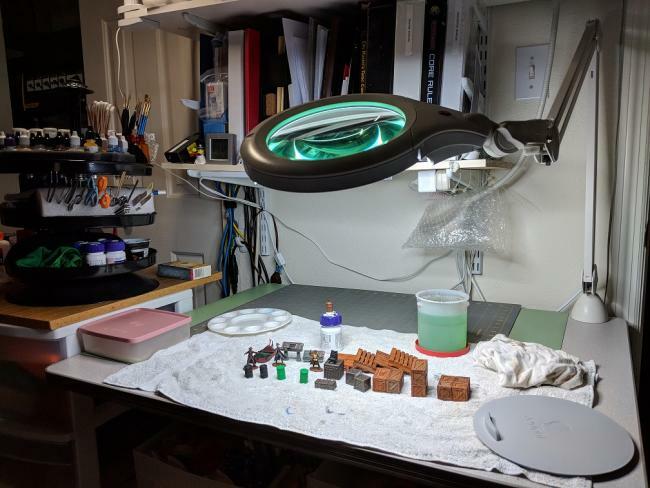 All my paints and brushes and unpainted minis reside in the lower box (paints in the bottom, brushes and minis and other do-dads such as a toothbrush and some tools reside in the tray). The middle box is where I store my palettes, my cleaning tubs, and my jars for washing brushes. The top box holds tools: files, pipettes, long swabs for cleaning up, mini bamboo skewers that work for a variety of things, sticky tack, and my sculpting tools for Green Stuff (which I have but have yet to use). 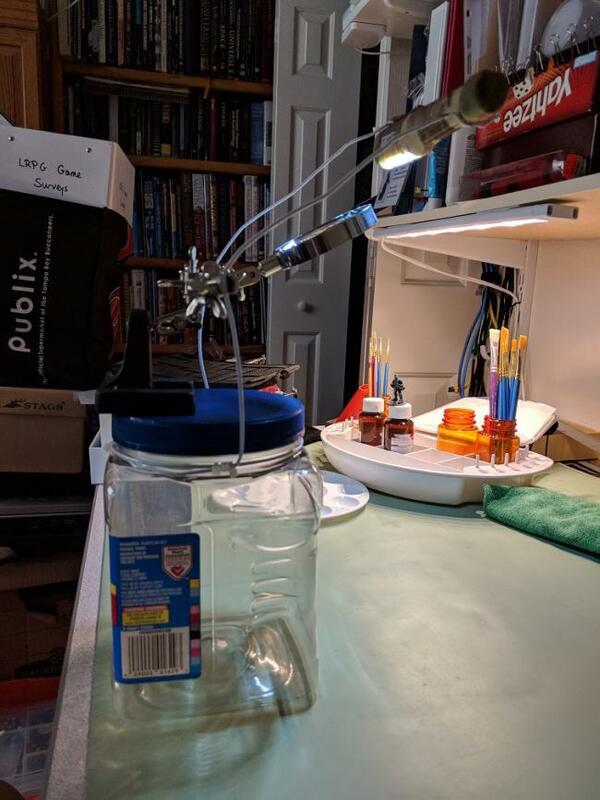 I also keep my smaller Ott light in the big container, as well as a pair of reading glasses and any in progress minis as well. Oh, and the Hobby Holder and my shot glasses I use for mounting my minis while I paint. You'll notice that the plastic tray I use for my wet palette is there and not put away (I wasn't sure if I was painting more or not when I packed this up). 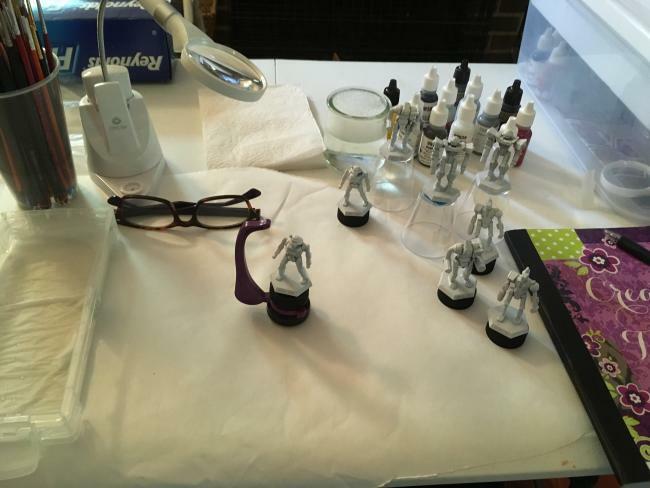 You can also see the primer I use (I have it in grey and black, too) and the sealer I use for minis. This is as I was setting up. 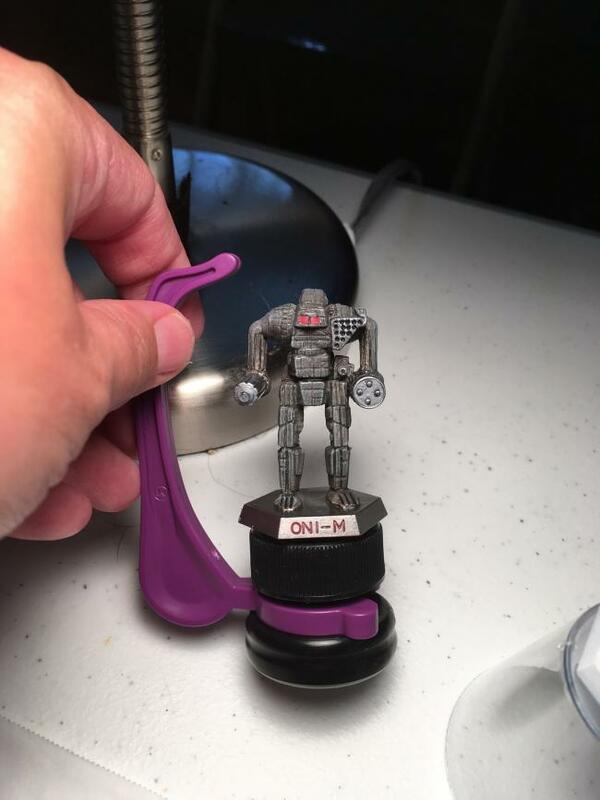 I was getting to use my new minis holder thing for the first time. 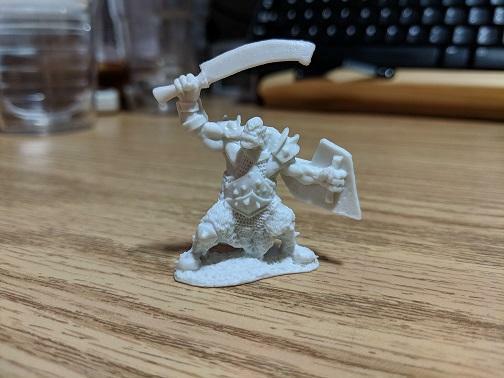 I backed it on Kickstarter and it's amazing. It only came with five bottle caps, so the other Mechs had to go on my go-to method of plastic shot glasses. This was also before I busted out an extra lamp to help with lighting. I've moved my painting area a few times over the years and now just have to be portable. As I was really into it. I typically don't use plastic palettes anymore. 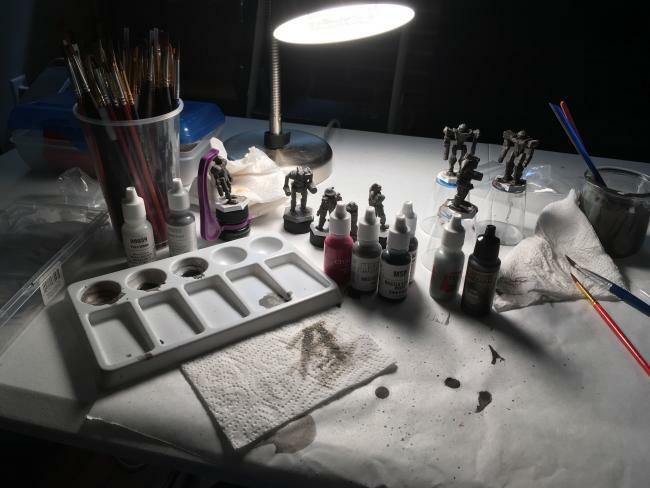 Other than for mixing washes or for some dry brush paints. I now use a wet palette and cannot recommend it enough for Florida. I can paint for hours without my paint drying out. I was even able to put the lid on it and come back a few hours later and my paint was still wet. A close up of the holder. It's called the Hobby Holder and can be found here. I love it. Now I'm going to collect more bottle caps so I can do a full army in my usual assembly line method and not need to rely on my plastic cups. 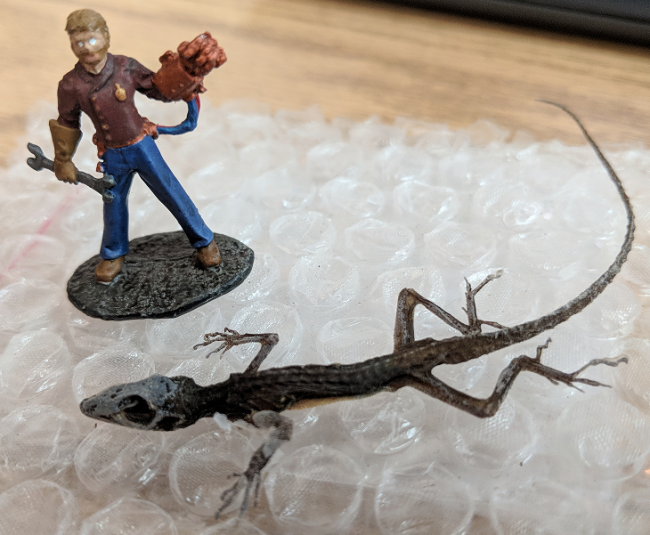 Today I'm transitioning to painting my terrain pieces, which uses straight craft acrylics. 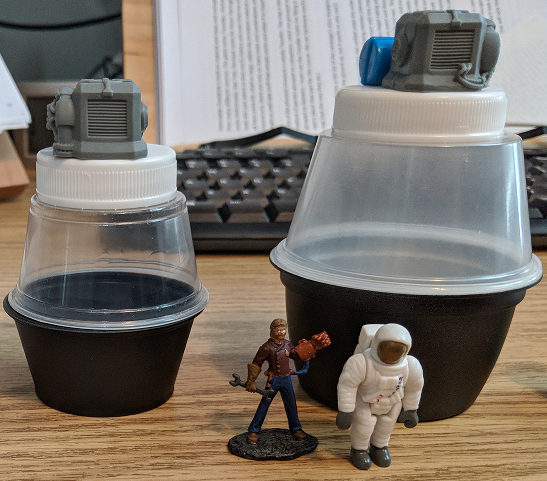 I need to get a container to store the paints, although I do have storage for all the terrain (both as individual blocks and once assembled on foam core). Thanks for all the photos and tips! I googled wet pallet and yep it makes perfect sense. I'll start using one. Forgot to ask. Do you use tap water, filtered or distilled? I use a big jug of purified water (which is distilled). Super cheap and I just keep it next to my station. I also use that for making my washes. Tap water runs the risk of adding things to your paint. Being so cheap, I agree. Why brother worrying about using anything else. My first attempt. I am not doing something right. 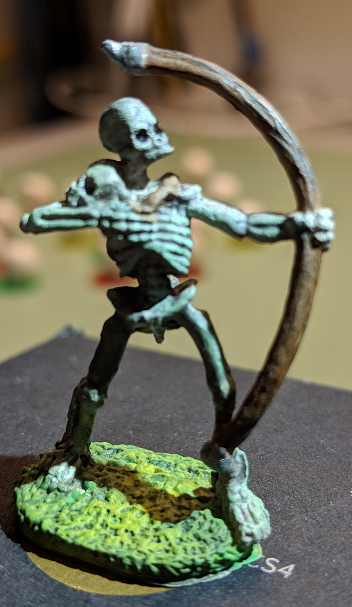 Instead of the typical crypt bone white skeleton I went with the skeleton of a ranger that died in the forest. Laying there on the ground his/her bones become dirty, moldy, and mossy. Here are some wooden pallets that turned out nice. Nice! I like to see various environmental effects on undead, skeletons especially. Here is my upgraded painting station. I had one of these swing arm magnifying lights from years back, however, the neck joint on it broke just before I moved here. 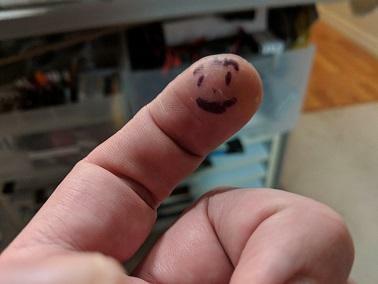 I recently came across it and thought I might try contacting the company for a replacement part. After a few e-mails they sent me a brand new lamp. VooHoo!! The other big upgrade was the three tiered swiveling parts holder. I got one on at Harbor Freight on sale. As you can see that's where I keep my paint, brushes and numerous handy tools and items. I also re-purposed the three tier plastic storage bin that was in the garage. I made the brush wash holder out of a cake icing container and a plastic spring I found somewhere in the rubble of my garage. You can see a few items I have painted, some are done some are waiting for embellishment. 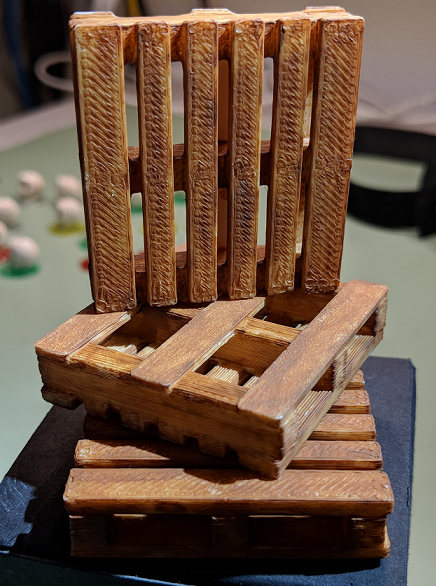 I made and panted some nice terrain pieces as well but, revealing those will have to wait until game time.